Recent research on the glymphatic system show, the brain’s own lymphatic detoxification system, a central drain of the brain via lymphatic pathways and lymph nodes in the lateral neck area. We often find the drain is not only blocked but backlogged back up to the brain. In addition, the blood drain of the brain is limited, especially the chase of neurological diseases, by the narrowing of the veins from the brain. The backlog into the brain causes micro-bleeding, iron build-up and poison backlog. They can be improved with ultrasound. The treatment in the side neck area takes about 3-5 minutes. 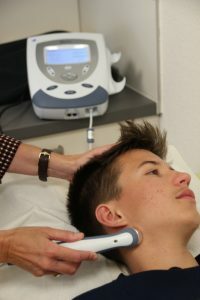 Naturally, therapeutic ultrasound can also be applied to the entire body depending on the indicators.